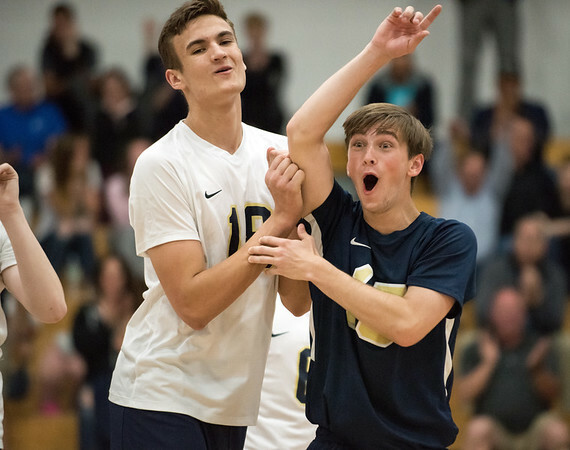 NEWINGTON - The Newington boys volleyball team is just four matches into its season, but the Indians already have a certain date circled on their calendar. Two months from now, the Class L state championship game will be played on that date, when Newington hopes to complete its quest for a third straight state title, and its sixth in eight years. After the team’s win over Enfield on Friday, multiple members of the Indians recited the date to remind themselves of what they’re playing for. Fravel wasn’t the only one. Coaches often harp on the importance of taking things a game at a time, but head coach Curt Burns lets his players embrace their ultimate goal. After all, it seems to be working over the past few years. Getting the best of an opponent hungry to topple the state champs is a challenge the Indians welcome with open arms. Facing tough competition will only further prepare them for June 6, and Newington plans to make it there once again, one way or another. For a team with such tunnel vision, is there ever a concern that looking ahead will cause Newington to trip over its own feet in the present? The team’s 4-0 record suggests otherwise, and Burns has done everything he can to ensure that his Indians receive plenty of tune-ups before the state tournament, including a May 13 date with Westfield High School in Massachusetts, a team going for its own three-peat in its Division I tournament come June. Newington is looking for any challenge that will get it to the date that’s been circled on its calendar since the season started. June 6 is still months away, but the Indians stare it down as if it’s arriving tomorrow. It doesn’t mean they’re losing focus on the next match at hand. It simply means their focus is on getting to June 6, and they know they can only do that by taking care of business in the here and now. If the rest of Newington’s opponents between now and June 6 bring their best, the Indians have a simple message: good luck. Fravel and the Indians are certainly focused, on today, tomorrow and especially June 6, 2019. Posted in New Britain Herald, Newington on Sunday, 7 April 2019 21:14. Updated: Sunday, 7 April 2019 21:16.